DAY 1 : TRAVEL DAY : We personally meet you from Madrid airport (terminal 1) and drive you to the beautiful Sierra de Montánchez. Time to relax at Finca Acehuche before drinks and dinner at 20.30. Or choose to travel independently, full directions are provided. DAY 2: DRAWING : 10.00 - 14.00 - We start the course with a session of observational drawing in the Finca studio terrace. I have taught life drawing and observational drawing for more than twenty years and developed a way to help you look more carefully and draw what you see more accurately. This is a good basis for the week, however you choose to sketch or paint. 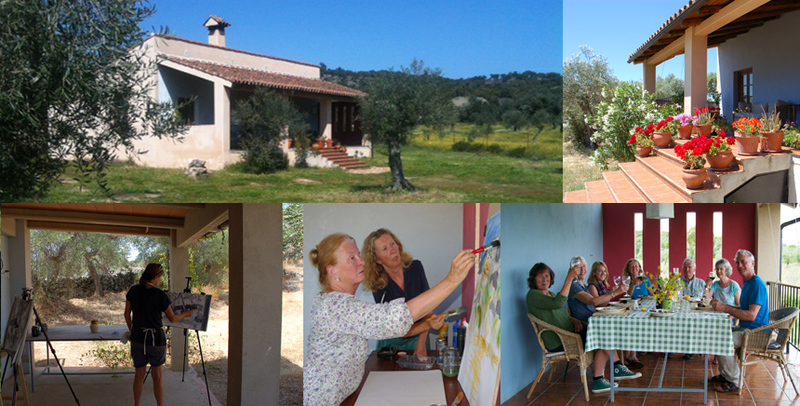 After lunch on the Finca terrace there is time to relax, walk, sketch or paint. 18.00-19.30 : tutored session drawing. 20.00 : drinks and dinner. DAY 3 : CULTURAL TOUR OF MÉRIDA: 10.00 - 16.00 - Gisela Radant Wood takes us on a tour of the Roman ruins telling us about the history of Mérida. After a leisurely lunch in a restaurant you have the option of visiting the Roman Museum with Gisela or sketching in Mérida with Noelle. We return to Finca Acehuche with time to relax before dinner. 20.00 : drinks and dinner. DAY 4 : URBAN SKETCHING AND PAINTING IN MÉRIDA : 10.00 - 16.00 - We start the morning with an optional workshop : how to find a good composition. The rest of the morning is spent sketching or painting with your media of choice and guidance from Noelle. After lunch you can continue sketching or painting or choose to relax and explore Mérida. We return to Finca Acehuche with time to relax before dinner. 20.00 : drinks and dinner. DAY 5 : URBAN SKETCHING in a local town or village : 10.00 - 14.00 - With guidance from Noelle we continue to develop observational skills alongside composition, tone and handling of materials. Lunch at Finca Acehuche with time to relax. 20.00 : drinks and dinner. DAY 6 : SKETCHING at one of Spain's only Visigoth churches : 10.00 - 14.00 - sketching and painting with Noelle. Lunch at Finca Acehuche with time to relax. 20.00 : drinks and dinner. DAY 7 : URBAN SKETCHING AND PAINTING IN MÉRIDA : 10.00 - 14.00 - We return to sketch the Roman sites, returning to Finca Acehuche after a tapas lunch. 18.00-19.30 - review of all your work with advice on how to progress. 20.00 : drinks and FAREWELL dinner. 08.00: Breakfast. 14.00: Lunches are plentiful salads, cheeses and cold meats at Finca Acehuche or lunch in Mérida. 20.00: Delicious dinners with local wine. NOT INCLUDED : Entrance fees and lunches on Days 3, 4 and 7, drinks and refreshments at cafes and bars. VENUE : Finca Acehuche is the base for this course. We drive to Merida (approx 30 minutes) on Days 3, 4 and 7 and visit a fine Visigoth church and local village (approx 15 minutes) to sketch on Days 5, 6. We return to the tranquil Finca for dinner and some lunches. This is a delightful country finca set in a walled 3 acre olive grove, tucked away in a varied landscape of olives, figs, grapes and pasture. We start the day with a leisurely breakfast, lunches and dinners are served on the large terrace with fine views. The large garden provides space with hammocks and loungers to relax, read or sunbathe. Some guests stay at one of the country fincas or hotels we have chosen in the area. We try to book the same accommodation and collect guests after breakfast and return after dinner. All transport is provided in the Sierra.